Many birthday dinners out at a restaurant when I was a teenager ended with a slice of mud pie topped with a candle. The slices were massive and could be shared with my whole family. I would always choose a non coffee version of mud pie, like chocolate mint or chocolate chip. Ice cream is pretty satisfying all on it's own, but when it's packed into a pie form with cookie crust and fudge topping, it transforms into something special. Jess from The Saucy Kitchen is our hostess for this week's Club: Baked pick and she chose Mississippi mud pie as the recipe the group would make. 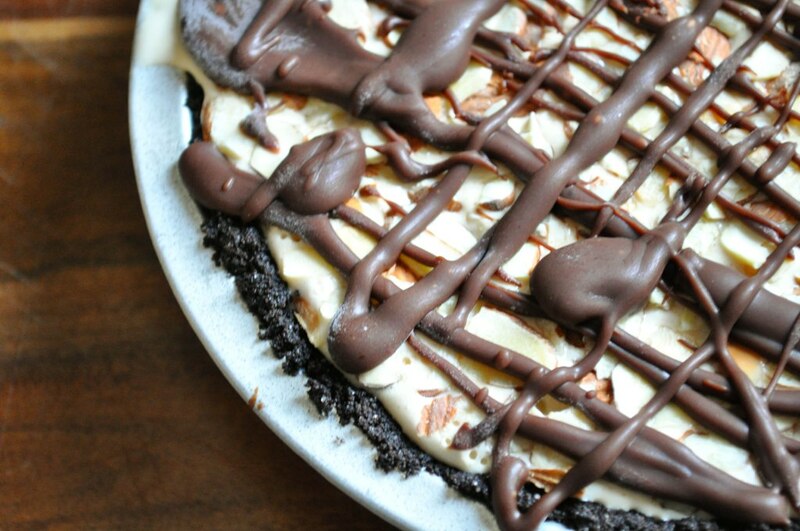 Even though I'm a fan of mud pie, I was a little hesitant to make this recipe because I knew it had coffee in it. I thought for sure the coffee would be in the fudge layers, but when I read through the recipe more closely, the only coffee was in the ice cream layer. A layer that could easily be changed out for another ice cream flavor. The authors of Baked Explorations say you can choose whatever ice cream flavor you like, but if you stray from the traditional coffee ice cream, you can no longer call it "Mississippi" mud pie. So, here I present, my non Mississippi mud pie. I used dulce de leche (caramel) ice cream instead of coffee. Other than the ice cream swap and using almonds instead of pecans (because I burned my pecans), I followed the recipe exactly. Well, sort of. I cut the recipe in half and made a mini mud pie. Hubby is not a chocolate fan so I wanted to make a small version. My father-in-law was going to be in town so I knew I could share it with him. Let's just say I shared 1/4 of the pie with him and I scarfed down the other 3/4 myself over the following 4 days. I would have to go shopping for new jeans if I had made the full pie. In case it wasn't obvious by my aforementioned pie hoarding, I really liked this mud pie. 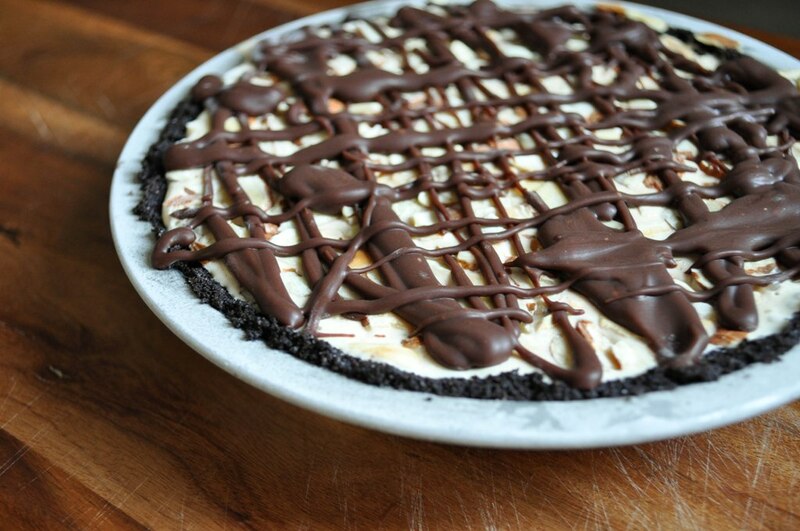 The crust is a chocolate cookie crust. I used Oreos minus the filling as the base because I couldn't find chocolate wafer cookies at my grocery store. I liked using Oreos because the wafer part on its own isn't overly sweet so it results in a deep dark chocolate crust. The next layer is a sweet, rich bourbon fudge. Just a hint of bourbon brings a depth of flavor to the fudge without being too boozy. Up next is the ice cream layer which gets topped by chopped pecans (almonds in my case). And finally the top is drizzled with more bourbon fudge. I didn't use all the fudge on top since I wanted to see a little bit of the ice cream beneath. The pie is stored in the freezer and is sliceable right out of the freezer. This is definitely a dessert geared toward a chocolate lover. But what is so great about this recipe is I can see it being tweaked and twisted into a variety of flavor combinations. 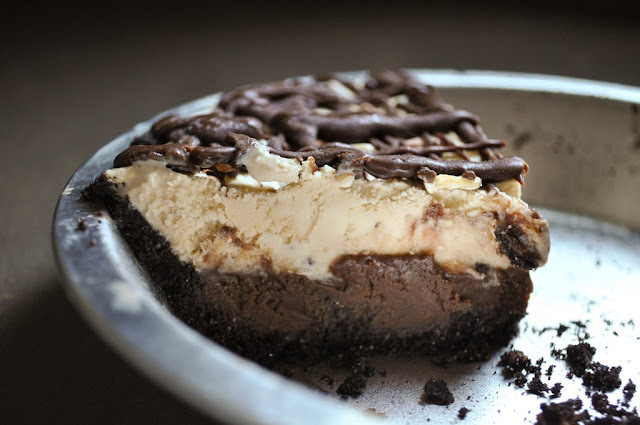 I'm already envisioning a chocolate mint mud pie, replacing the bourbon in the fudge layer with a bit of peppermint extract and a layer of mint chip ice cream. Or a strawberry shortcake version...with a graham cracker or vanilla wafer cookie crust instead of the chocolate crust. White chocolate can be swapped for the dark chocolate in the fudge layers and amaretto in place of the bourbon. Fresh strawberry ice cream nestled in the middle and you have a fun play on mud pie meets strawberry shortcake. Really, the possibilities are vast. What I love about this recipe is it's easy and presents beautifully. It does require a little planning ahead because the various layers have to chill or freeze until the next can be completed. You can't throw it together an hour before guests will be arriving unfortunately. I spread it out over two days and it was a cinch. Now that I've been schooled on the ways the mud pie...I'm excited to try other flavor combinations. To get the recipe head over to The Saucy Kitchen. Thanks for a great pick Jess! To see how my fellow Club: Bakers did with their pies click here. Oh boy, I bet it was delicious with caramel ice cream! I too felt it was a recipe for a super-chocolate-lover - so I omitted the last chocolate topping and subbed in a salted caramel sauce. I'm sure that would go super well with your ice cream flavor choice! Oh, caramel ice cream would be delicious! 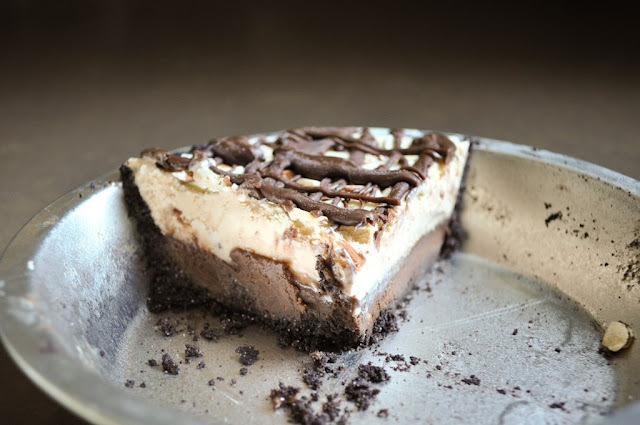 I had never had mud pie before this, or ice cream pie for that matter, but I was also already thinking up different combos to try. The strawberry version of you mention sounds amazing. Thanks for baking along! I don't know if I should thank you or give you an evil eye for reminding me of this wonderful dessert! I love the ice cream flavor in your pie! I am always looking for the chocolate wafer cookies too. Wonder where they are hiding! lovely! I used other ice cream as well. Love the variety of stuff that you've thought of! It's my Mom's birthday next week, she's 84. This will make a perfect dessert for her birthday dinner. Thanks. Hmm, I never knew about the coffee aspect, This is a true comfort dessert and I would make this in a heartbeat! Wow! Looks so good!The bourbon fudge sounds especially intriguing. Looks great Gloria! I plan to post mine when I get home. I was a little worried about the coffee ice cream because I'm not a big coffee ice cream fan, but I tried it and ended up really liking it. Dulce de leche sounds great. I might have to do that next time! This looks fantastic Gloria! I love coffee ice cream, and your post is making me wish I had some in the house. I can't trust myself with this pie so I'll have to wait for an occasion to share with friends before I make it. WOW! This looks amazing! I probably would have eaten the whole thing myself, too. Mini pie plates are ingenious!! That looks amazing! Can't wait to try this, and the Banana Cake with Nutella Frosting. Is there anything that doesn't taste good when it has Nutella on it? I think not!